GG Audio has released Spin, a virtual version of a rotating speaker. 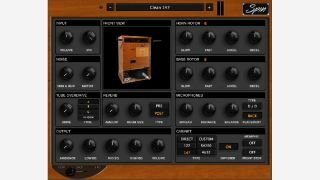 This new plugin emulates the classic Leslie 122 and 147, as well as a custom high power model and Yamaha’s RA200. If you want some overdrive, you can dial in one of three separate amp sims, and you can also tweak the tone by tweaking the mic positions. You can adjust multiple parameters for your selected speaker, and there’s a 3-band output EQ. Find out more and download a demo on the GG Audio website. Spin costs $49 and is available for PC and Mac in VST/AU/AAX formats.